With Jeff Nichols’ latest coming of age, crime drama, Mud, Matthew McConaughey’s character finds himself at the other side of the law, living on a boat, and in this new poster, holding a gun. Mud follows the friendship between two teenage boys and the titular character, played by Matthew McConaughey. The children discover that Mud is hiding from the authorities and a crime family on a boat. He’s been charged with murder, a crime that he committed in order to protect his girlfriend, Juniper, portrayed by Reese Witherspoon. With the cops and a vengeful father on Mud’s tail, the boys’ friendship with Mud is tested as the children must determine if their friendship is worth hiding and aiding a fugitive. 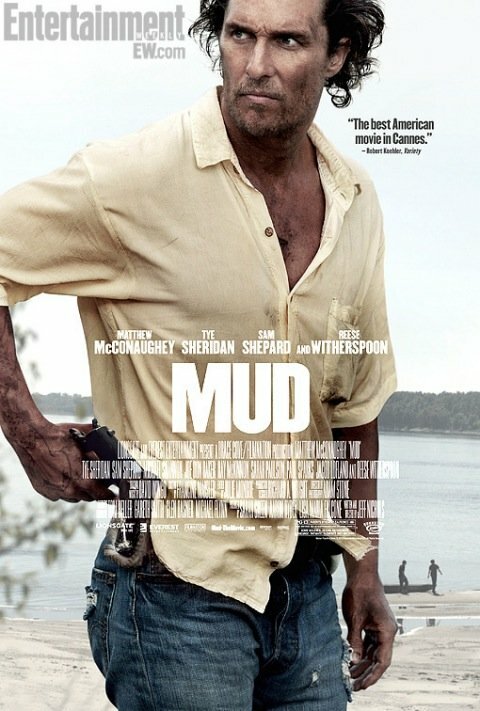 Mud’s poster portrays McConaughey in all his muddy glory. He’s at the center of the poster, with the two young boys playing beside a boat behind him. With this view, it seems like he’s protecting not only himself but also his new friends and their environment. Mud’s trailer seems to have the same atmosphere and tone as Nichols’ Take Shelter. Nichols is a director who’s good at illustrating some of the trials experienced in different relationships. Be it in a marriage or just in a friendship. Though he has directed only three movies, he has acquired a good signature. His movies are usually emotionally rich and heartfelt, wrapped in an exciting plot with a raw, painful reality at their core. Matthew McConaughey has been establishing his career with a couple of serious roles that don’t follow the usual romantic comedy route. From the movie’s trailer, he seems to give a very commanding and powerful performance in Mud. I was captivated with his performance as Mickey Haller in The Lincoln Lawyer, and I’m very much excited to see him tackle a new role. Joining him is Michael Shannon, who portrayed the main character in Take Shelter, as well as Sarah Paulson, Sam Shepard, Paul Sparks and Joe Don Baker. Mud will hit theaters on April 26th. In the meantime, you can check out the poster and trailer below and let us know your thoughts in the comments section.